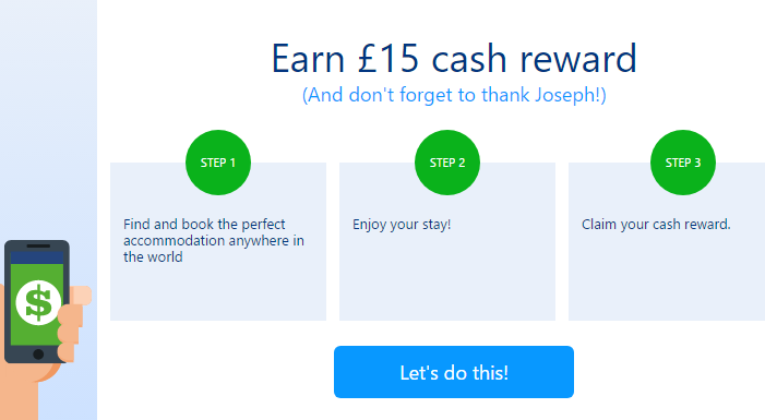 You can currently get a £15 Booking.com credit for signing up through a referral link and booking a stay. The person who refers you gets £15 after your first stay too, so if you use my link to sign up, I would be much obliged! 1. To refer a friend, do I need an account with Booking.com? You need to have a Booking.com account or have made a reservation with us. Don’t have an account yet? It’s easy – just sign up here and you can start referring friends too! 2. How and when can I claim my reward? The reward is a refund on your credit card after your friend has completed their stay. A few days after your friend has checked out of their booked accommodations, an email is sent to you about claiming your reward. To receive your reward, you need to have a Booking.com account or sign up for one. Then all you have to do is register your credit card details on your account. If you’ve registered more than one credit card, just let us know which card we should send your reward to with our checkbox option. If you’ve already supplied your credit card details on your account and clicked our checkbox option, we’ll send the reward automatically and no further action is needed. If you’ve registered more than one credit card, just let us know which card we should send your reward to with our checkbox option. You should receive your reward within seven working days after giving us your card details (unless your friend hasn’t checked out). 3. What if I don’t have a credit card to claim my reward? No problem – you can use a debit card instead (VISA or Mastercard) and claim it the same way as a credit card. 4. How does my friend receive their reward? Your friend receives their reward after their stay. After they’ve checked out, we’ll send them an email on how to claim their reward. To receive their reward, they need to have a Booking.com account or sign up for one. 5. Why hasn’t my reward arrived? Usually people don’t receive their reward because they haven’t given us their credit card details. The reward will be sent once we’ve received credit card details and your friend has completed their stay. 6. How many rewards can I receive? You can receive a maximum of 10 rewards. A friend can only make one eligible booking from your link and receive one reward. After getting their reward, your friend is not eligible for future rewards from links sent to them by other people. 7. What happens if my friend cancels their booking? If your friend cancels the booking, neither you nor your friend will receive the reward. However, if your friend makes a new booking with your link, you’ll both still be eligible for the reward. 8. How can I check the status of my reward? You can check your current reward status and reward history by visiting your account. 9. Can I use the reward as a discount for a future booking? No, the reward can’t be redeemed for a future booking. The reward is only given as a refund on your credit card after your friend has booked and completed their stay. 10. Who do I contact if I have further questions or if there’s a problem? You can email our friendly Customer Service Team at customer.service@booking.com. Remember to include the email address from your Booking.com account in your email. Don’t forget that you can currently earn 8 Avios per £1 at Booking.com via the Avios eStore too. Booking.com tends to offer a wider range of accommodation options than most hotel booking sites. Historically, it’s been difficult to get more than a few percent back in cashback/Avios etc though, so it hasn’t been of much interest to savvy ‘travel hackers’. Leave your own referral link on the forum here! 1.) Download the Booking.com app from the App Store or Play Store and get $25 credit. 2.) Enter code SAHBAZ14 under the my coupon code from the left. 3.) How do I get my cash reward? How do I get my cash reward? Use this one and get EUR 15 reward! ? Thank you for the $25 reward referral. Here is one for £15 off your next booking—hope someone fnids it useful! •	Click on the link ! •	It’s so easy !! ? I’ve just been sent this referral link. Use it for booking accommodation via their site and you and I will each earn 10% cash reward. * STEP 3 Enjoy your stay! I. Download the Booking.com app from the App Store or Play Store and get $25 credit. II. Enter code ALI21238 under the my coupon code from the left. III. How do I get my cash reward? BRAND NEW ONE! 🙂 Use this link and get EUR 15 reward! ? The most recent link for 15 €. Advantageous offers from Booking especially for those who like to travel. Discount applies to old and new accounts. You can only use it once for 1 account. Here is one for $15 off your next booking — hope someone fnids it useful. Free £15 referral link – valid and working as of JUNE 2018. Hi, how can I get my own referral link for reward 25 USD? I got to my account only 15 USD referral link. Can someone help me? To have the referral link with 25USD reward, you have to make a reservation through a invitation link that have 25USD reward. So you can book a hotel with my link, and use a new email and create a new account after the reservation. Then, after check-out, you will get the referral link with 25USD. New account can be created under the same name as I use currently and where I already got 15 usd referral reward? And for payout of reward after check-out can be used the same credit card? Only different (so far not used) email address/account is significant to get the reward again? Same names, different card and email. Get 15 usd when you book for 30 usd or more. $25 link on on a $50 booking. If you’ll book using this link you will get 15 € back. Thanks for your link Andy. If you book using this link, you’ll get 15euro back after your stay and I’ll receive a tenner for referring you. Get 25 usd when you book for 50 usd or more in your first booking using this link. Get 15 € when you book for 30 € or more. 15€ cash back for every reservation! Feel free to use it anytime! 10% back for stays over 30$. Thanks. Cashback 10% if you use this link to book:, thanks!! Use this link, I get £15 and you get £15. Easy! Booking must be £30 but you get 15 back. Link can be used 9 more times by different people. (Any currency will be refunded). Thanks! 10 users are welcome to get cashback ! Use this most recent referral link and get US$25 reward with Booking from 50$! €15 cashback with the link below! You have to book a hotel min. £30 and after your stay you will get cash back £15 back on your credit/debit card. Make sure you use web website to book no mobile up. Once you click through link above you should see the green banner confirming that you’ll get £15 back with a minimum booking cost of £30. There will be confirmation on your final booking page, that you will get cashback once you stay. https://www.booking.com/s/12_6/d6f7e54c for 15 euros off!! It’s no problem. You can use a debit card instead (VISA or Mastercard) and claim in the same way as a credit card. Your friend receives their reward after their stay. After they have checked out, we will send them an email on how to claim their reward. To receive their reward, they need to have a Booking.com account or sign up for one. I wanna make sure you can get money back ! It takes some time to get money back, but it works. Do you use booking.com website for booking a hotel ? Use this link, I get $15 and you get $15. Easy! Booking must be $30 but you get 15 back. Here is my link. I’m new so there is no limit. Enjoy your booking.com gift. Don’t be afraid to use it, we both get refunded! My friend used it and it worked perfectly! Note that you can use only once a 10% referral link per account. Use this link and get 188 CNY (around US$29) reward with Booking from 376 CNY (around US$58). Use this link and get 1000RUB reward with Booking from 2000RUB! Booking.com referral code for 10% discount on your stay! 15 Euro discount for you! Use this link to get $15 off on your next booking at booking.com from $30 minimum! Use this link and get 15 € reward! Thanks & enjoy your discount! Hi, here is another link, with it you’ll get 10% discount back! Get 50 PLN for ANY reservation with Booking. $25 back for you with this link. 2.) Enter code SAHBAZ98 under the my coupon code from the left. It’s easy! Add your credit card details and register it for receiving rewards. $25for you with this link! You can use my link to get 10% back! I have $25 USD referral link. Use my link and get $25 cashback after your stay if you spend $50 or more. Save 10% off your booking through this link! Use link and get $25 cashback after your stay if you spend $50 or more. You can get only once a 10% cashback per account. Get $15 back when spending over $30. It is better to use one tipe off references for one account only. Use this link and get US$ 15 reward with Booking from30$!! Use this link and get a 15€ bonus after your travel! Tried out already by a friend, certified working! Spend at least 30 USD, get back 15 USD. Valid ! Ideal for cheaper accommodation ! Use this link and get US$15 reward with Booking from 30$! ? Use this link and get US$25 reward with Booking from 50$!! ? US$15 reward with Booking from 30$! ? US$25 reward with Booking from 50$!! ? US$15 reward with Booking from 30$! US$25 reward with Booking from 50$!! Use this to get 15€ back! Enjoy $25 for booking. Cheers! Use this link and get EUR 15 reward with Booking from EUR 30 !! Click on the link and make reservation. Great for shorter and cheaper accomodation – spend minimum 30 USD . Use one of this links ? Brand new links. Use it! Use this link and get EUR 15 reward! ? Use this link and get EUR 15 reward! Valid 15 $ (USD) link. You have to spend minimum 30$. Ideal for shorter and cheaper accommodation. Complete your stay at your accommodations booked through Booking.com, Claim your $25 cash reward based on the price of your accommodations in the form of a refund to your credit card or debit card. ***Use this link and save 10% with Booking! Use these links to get rward! Use these links to get reward!